Wherever your vacation takes you, it’s handy to have some local currency in your pocket before you travel. Whether you’re going to Mexico or Europe, we’ve got you covered. With a choice of over 45 currencies and a prepaid currency card, we’ve made it easy for you to get your travel money. 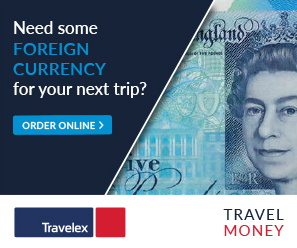 Simply order online and Travelex will deliver straight to your door next day. What are the fees and limits? Please click here to view the fees and limits. The fees we charge are subject to change from time to time, in accordance with the Agreement. You will be notified of any change in the applicable fees. If your card is damaged, lost, stolen or misused, please contact Card Services immediately. If you requested an additional backup card, you can continue accessing and spending your funds with no delay. If you don’t have a backup card, don’t worry; a replacement card can be organized for you. Alternatively, we can arrange for emergency cash in the local currency (up to the value remaining on the card and subject to availability), anywhere in the world, normally within 20 minutes (in some remote locations this could take up to 24 hours). Call Card Services 24 hours a day, seven days a week. You can find contact numbers here. Travelex Money Card is Mastercard contactless enabled. Mastercard contactless is the faster way to pay for purchases of under $50. No signature or PIN is required. Just tap your card against the reader and go. Please note, transaction limits are subject to change and different transaction limits will apply in different countries. Call Customer Service: 952-858-4888 or toll-free 1-877-457-1305, or email us at Customer Service. * Please be advised that although Travelex does not charge ATM fees, some operators may charge their own fee(s) or set their own limits. Please check with the ATM before using. Travelex Money Card is issued by MetaBank®, Member FDIC, pursuant to license by Mastercard International Inc. Mastercard is a registered trademark, and the circles design is a trademark of Mastercard International Incorporated. “Travelex™” and the “Travelex Worldwide Money Logo™” are registered trademarks of the Travelex group.